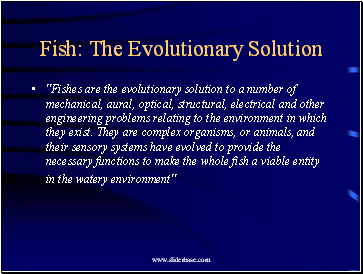 "Fishes are the evolutionary solution to a number of mechanical, aural, optical, structural, electrical and other engineering problems relating to the environment in which they exist. They are complex organisms, or animals, and their sensory systems have evolved to provide the necessary functions to make the whole fish a viable entity in the watery environment"
Humans, who are only one species, and who can see all of the colors of the spectrum have a trichromatic visual system. They have blue, green and yellow/orange sensitive cones in their eyes. 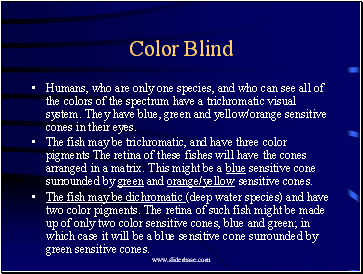 The fish may be trichromatic, and have three color pigments The retina of these fishes will have the cones arranged in a matrix. This might be a blue sensitive cone surrounded by green and orange/yellow sensitive cones. The fish may be dichromatic (deep water species) and have two color pigments. The retina of such fish might be made up of only two color sensitive cones, blue and green; in which case it will be a blue sensitive cone surrounded by green sensitive cones. Color vision is our visual systems sensitivity to light photons in the band of electromagnetic frequencies called the visible spectrum. It goes from red, orange, yellow, green, blue, indigo to violet. 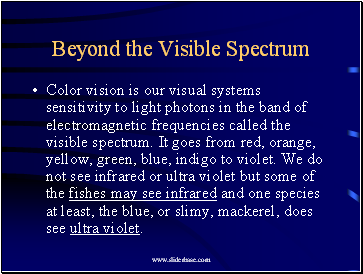 We do not see infrared or ultra violet but some of the fishes may see infrared and one species at least, the blue, or slimy, mackerel, does see ultra violet. We and the fishes have an adaptive eye that is sensitive to the illumination level. If the light level is low or photon limited, there is no color vision. The brightness of the color or brilliance depends on the illumination. If the illumination is high the color is light and bright. If it is low the color is dark. 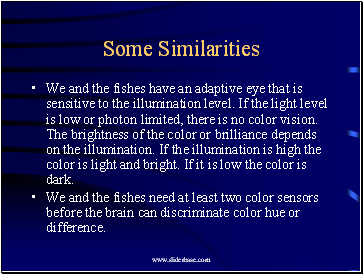 We and the fishes need at least two color sensors before the brain can discriminate color hue or difference. 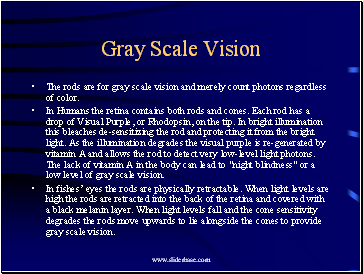 The rods are for gray scale vision and merely count photons regardless of color. In Humans the retina contains both rods and cones. Each rod has a drop of Visual Purple, or Rhodopsin, on the tip. In bright illumination this bleaches de-sensitizing the rod and protecting it from the bright light. As the illumination degrades the visual purple is re-generated by vitamin A and allows the rod to detect very low-level light photons. The lack of vitamin A in the body can lead to "night blindness" or a low level of gray scale vision.